Nails in your yard? Who cleans up? Home Blog Nails in your yard? Who cleans up? As I have outlined in an earlier blog post a roofing project is much like life… A failure to plan is planning to fail. This especially holds true with respect to cleaning up and maintaining your property’s beauty long after we have left your home. As a premier roofing contractor in Fort Worth, TX this title does not only pertain to the installation of your roofing system. It also is largely dependent on our exclusive Excel Roofing Asset Protection Package. The Asset Protection Package that we offer will not only protect from falling debris but it includes picking up debris that has fallen from the rooftop onto your lawn and flower beds. The main culprit of all the dangers left behind by roofing contractors are roofing nails and plastic caps. There are an average of 16,000-24,000 nails on an average roofing project. That being said when we re-roof a home there are that many nails coming out of the roof as we tear off the old roof and felt! That is 24,000 chances to fall from the roof edge and down into your grass and be a potential to harm you or your loved one’s foot. As a premier Fort Worth roofing contractor it is our goal and mission to Be Excellent. That being said you may never think about your roof again after we leave unless of course your toddler is playing outside barefoot and winds up stepping on a rusty nail! At Excel Roofing and Construction roofing is a team sport. This stems from our sales team, production managers, service technicians, and roofing installation professionals taking your project on as if they were at their own home. 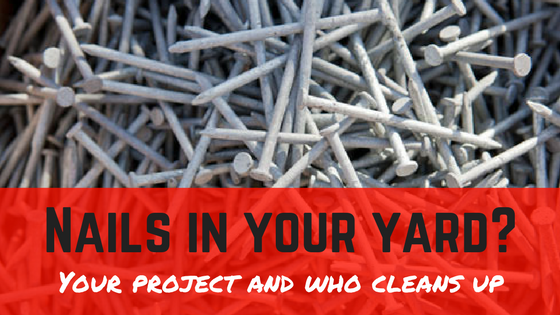 At some time or another, on all projects, you will find everyone on the team with a magnet in their hands trying to ensure that we pick up virtually 100% of the nails that come off of your roof. In addition to during the project, upon completion of roof top activities, you will find our project manager making a last sweep of the yard with a magnet to ensure your property is again ready for you and your family to enjoy your yard with the peace of mind that we have cleaned thoroughly. Our team at Excel Roofing and Construction would love to be your Fort Worth Metroplex contractor of choice the next time you need work completed on your #1 Asset. To reach one of our team members call our office at 817-645-1788 or submit a web request through our website. We look forward to serving you with professional service.